The Grand Cru Engelberg finds itself on the summit of Mont Scharrach, located in the region called Couronne d'Or, the vineyard area west of Strasbourg. Engelberg rests on calcareous soil, which provides potent wine with excellent character and structure, regardless of variety. Here, Jean-Marie Bechtold crafts delicious wines in a truly personal style in which he achieves a brilliant combination of restrained, velvety softness, dryness and elegance. 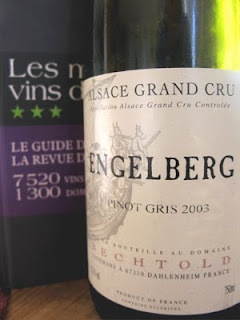 2003 Pinot Gris Grand Cru Engelberg has an aroma of coffee, dark berries, liquorice, fennel and a slightly hot, exciting tone of Grand Marnier. The taste is velvety, juicy, medium full-bodied and quite dry with amazingly vivid fruit acidity in the aftertaste. A remarkably fresh 2003. Price: €10.50.